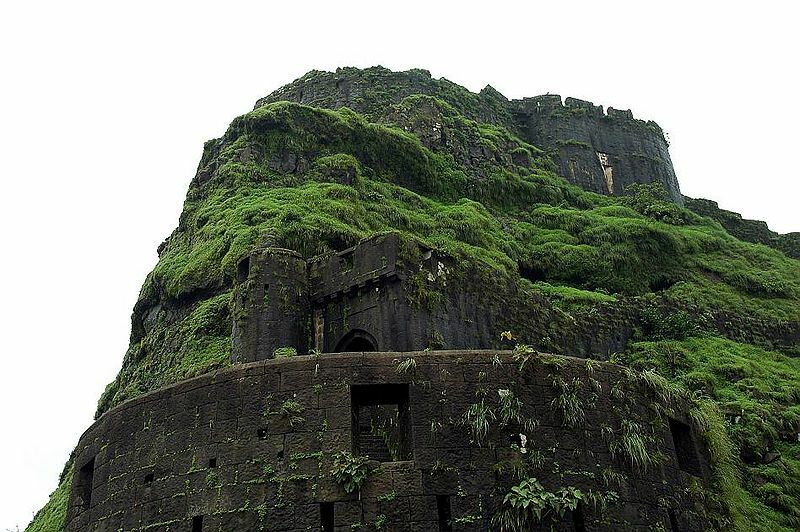 Erected at a height of 1,422 m the climb is the third highest and one of the most visited hill forts in Maharashtra. 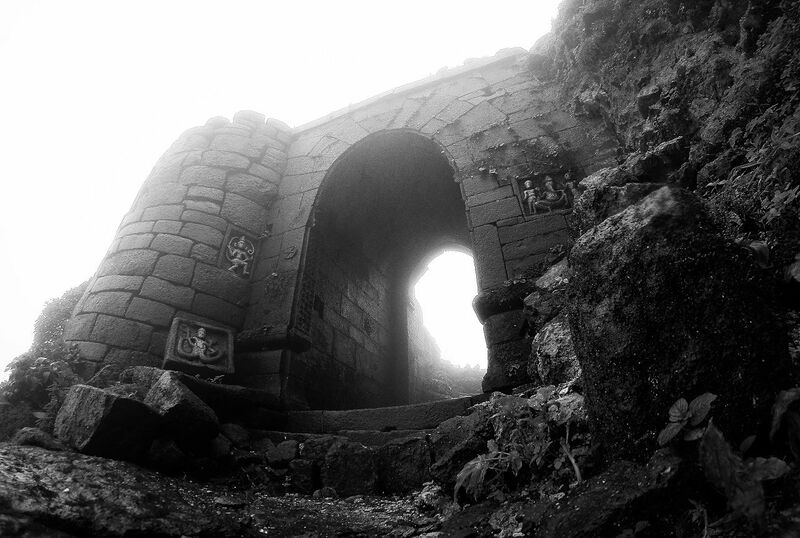 Harishchandragad fort is situated in the Ahmednagar district of the state. Built in the early 6th century, it was a citadel of the Kalachuri Dynasty who ruled the area at the time. The fort was later captured by the Moguls and was then seized by the Marathas in battle. It played a major role in guarding and controlling the surrounding areas. 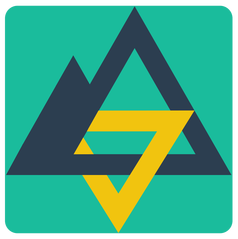 Popular amongst trekking enthusiasts and also known as the ‘trekkers paradise’, the climb to the peak is a difficult one but the view at the top makes the effort worthwhile. Steep climbs and wide gullies make this a perfect place to indulge in rappelling, rock climbing and valley crossing in one trek. The trek has an 80-degree climb to the peak of Konkan Kada which is a concave cliff that resembles the hood of a cobra and has a breathtaking view of the surrounding ranges. The fort has nearly 9 ancient caves including 2 big caves with carvings that date back to the 11th century, the Kedareshwar Cave being one of the larger ones. 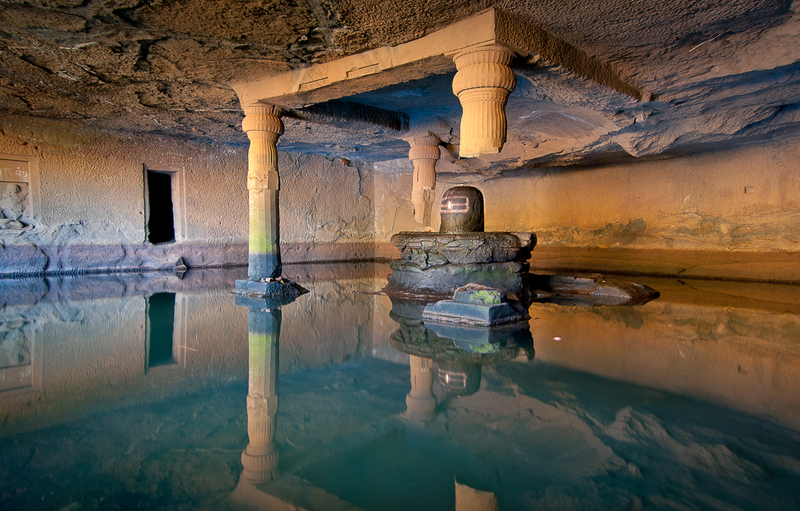 This cave dedicated to the god ‘Shiva’ houses a ‘Shivlingam’ surrounded by ice cold water and pillars on four sides, three of which have collapsed. Legend has it that the day the fourth and final pillar collapses will be the end of all days. Ratangad fort is situated in the Ahmadnagar district of Maharastra standing at a height of 1297 m. The fort is nearly 2000 years old and was once captured by the Maratha king Shivaji, it is said to be one of his favourite Forts. The Fort’s strategic location overlooked Borghat which was a popular historical trade route. Ratangad lives up to its name that when translated means jewel. Surrounded by beautiful hills, during the monsoon this trek is a sight for sore eyes. The trek takes you through forests, streams and rocky terrain that although beautiful may prove a little difficult to scale for beginners. The peak has formed a natural hole in the rock due to wind erosion, which is called the ‘Nedhe’ or ‘Eye of the Needle’. 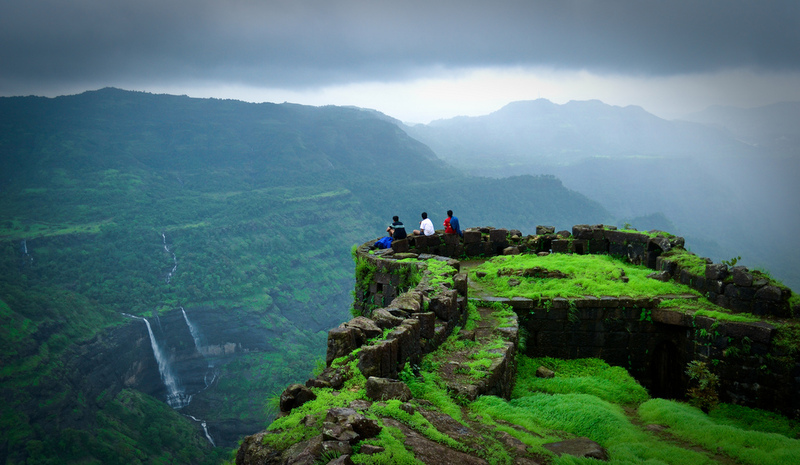 Considered as one of the easier treks to embark upon the Lohagad Fort is located at a height of 1,033 m near Lonavala. Lohagad divides the basins of Indrayani and Pavana. Also known as ‘The Iron Fort’ Lohagad was largely occupied by the Marathas until Shivaji was forced to surrender it to Mughals in the treaty of Purandar. He soon recaptured the fort and used it to store his treasury. The fort has fortified spur called that resembles a scorpion’s tail called Vinchukata. There are four large gates through which you can enter the fort that remain intact till date. It also houses the Karla Caves which is a complex of ancient Buddhist shrines. The oldest of which is believed to date back to 160BC.During the monsoons, the fort stays covered in mist and fog. One of the most famous treks in Maharashtra, the Rajmachi Fort is situated at a height of 2750 ft in the Sahyadri mountains. This fort, like the Ratangad Fort overlooked the Bhorghat pass which was a major trade route in the Maratha empire and played a strategic role in the First Anglo-Maratha War. With the downfall of the Maratha empire in 1818 the British acquired the control over Maratha territories including Rajmachi. The fortified structure houses two forts namely Shrivardhan fort and Manaranjan Fort. The climb to the peak is very easy and is popular amongst people trekking for the first time as it takes only around 40 minutes to scale and the view at the top is magnificent. The fort also has a number of caves(which are also used as campsites) and old temples for you to explore. 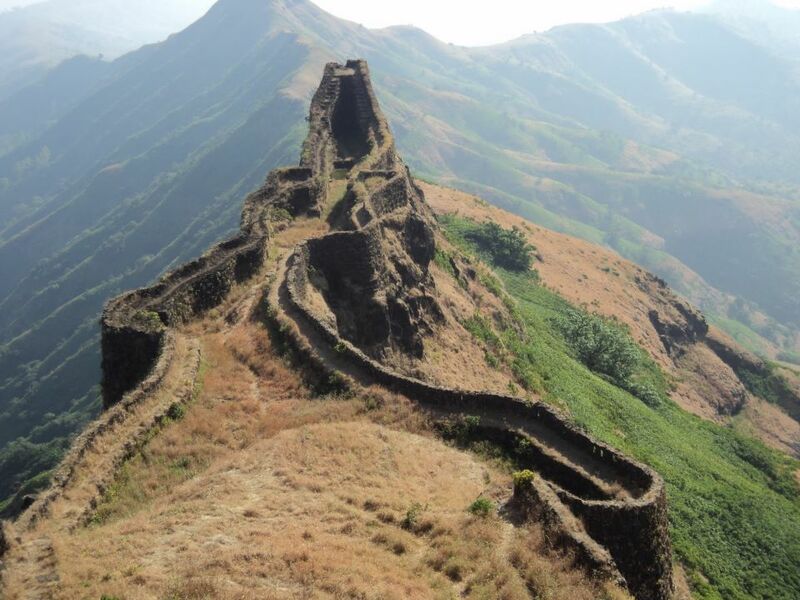 Torna Fort also known as Prachandagad is located in the Pune district of Maharashtra. Prachandagad translates into ‘Large Fort’. Torna is historically significant because it was the first fort captured by Shivaji at the young age of 16. After taking over the fort Shivaji constructed several monuments and towers within it. Legend has it that during the repairs of the fort, Shivaji found pots full of gold coins which he later used to build the Rajgad Fort which is 13 km away. Torna Fort is said to be constructed by devotees of Lord Shiva in the early 13th century. The climb is a little difficult the trail gets a little steep at times. When you reach the peak you are rewarded with a grand view of the surrounding hills and the Khadakwasla Dam. While the winter and monsoon are the best time to trek, it may not be possible to reach the peak in the monsoon due to heavy cloud cover.